Special counsel Robert Mueller filed a new indictment Friday against former Trump campaign chairman Paul Manafort, charging him and a Russian associate with obstruction of justice for allegedly trying to tamper with witnesses. The grand jury action against Manafort and Konstantin Kilimnik, who law enforcement officials have said is associated with Russian intelligence, marks the latest tightening of the screws by Mueller. Prosecutors previously raised the witness tampering claims in a motion to revoke Manafort's bail. Manafort was arrested in October, along with business partner Rick Gates, on charges that stemmed from their lobbying work in Ukraine, including conspiracy, money laundering, and failure to disclose overseas bank accounts. The alleged crimes are not linked to Mueller's investigation of Russian meddling in the 2016 presidential election, although they arose from that probe. Earlier this week a judge ordered Manafort to respond to allegations of witness tampering when prosecutors first raised them and sought to have Manafort's bail revoked. Those same allegations are behind the superseding indictment unsealed Friday in court. Manafort responded Friday to the allegations he tampered with witnesses in a filing made by his attorney, which calls Mueller’s accusations and filings “heavy-handed gamesmanship by the Special Counsel" that a judge should not condone. Attorney Kevin Downing wrote in the filing that the allegations are based on "the thinnest of evidence." He says a few texts messages and an 84-second phone call with two former associates provide "scant" evidence of tampering. Downing also argued that Manafort doesn’t know who will be called at trial, and therefore questions how his client would know that reaching out to two former colleagues meant he was reaching out to two witnesses. The attorney pointed out that prosecutors telling the court that Manafort was using encrypted applications implies he was conducting illegal activity — calling it a “not-too-subtle attempt to poison the potential jury pool” against Manafort. Since the initial indictment, Gates and others have struck plea deals with Mueller, while new charges have been piled on Manafort in superseding indictments. The latest charges come in the third superseding indictment against him. It says that between February 23 and April 2018, Manafort and Kilimnik "knowingly and intentionally attempted to corruptly persuade another person, to wit: Persons D1 and D2, with intent to influence, delay, and prevent the testimony of any person in an official proceeding." 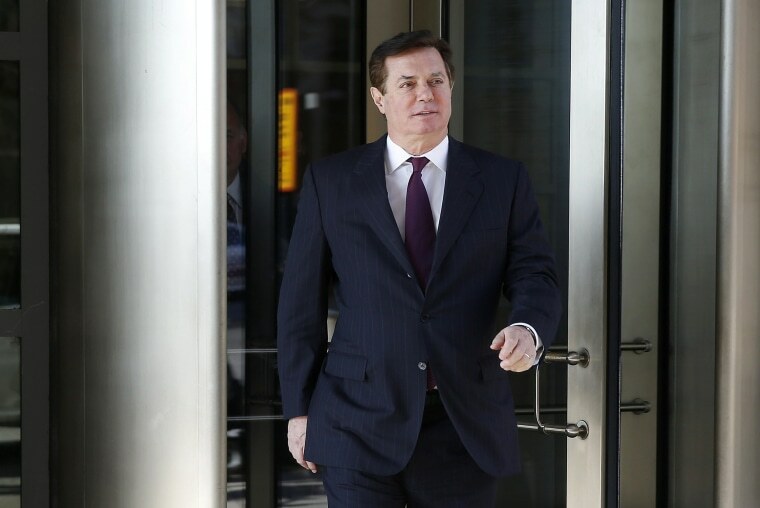 The bail revocation motion filed earlier this week said Manafort used encrypted messaging applications to try to reach two unnamed business partners who could be witnesses to his alleged fraud and money laundering. One of the potential witnesses said he believed Manafort's outreach was an attempt to "suborn perjury" or to instruct him to lie after a superseding indictment was filed in February against Manafort, prosecutors allege. In response to the motion, Manafort spokesperson Jason Maloni said, "Mr. Manafort is innocent and nothing about this latest allegation changes our defense. We will do our talking in court." The New York Times identified the business partners who turned on Manafort as two veteran journalists who had a project that was bankrolled by him to the tune of $2 million. Kilimnik allegedly helped Manafort coordinate an entity nicknamed the Hapsburg group, which hired influential Europeans to lobby the United States on behalf of Ukraine.